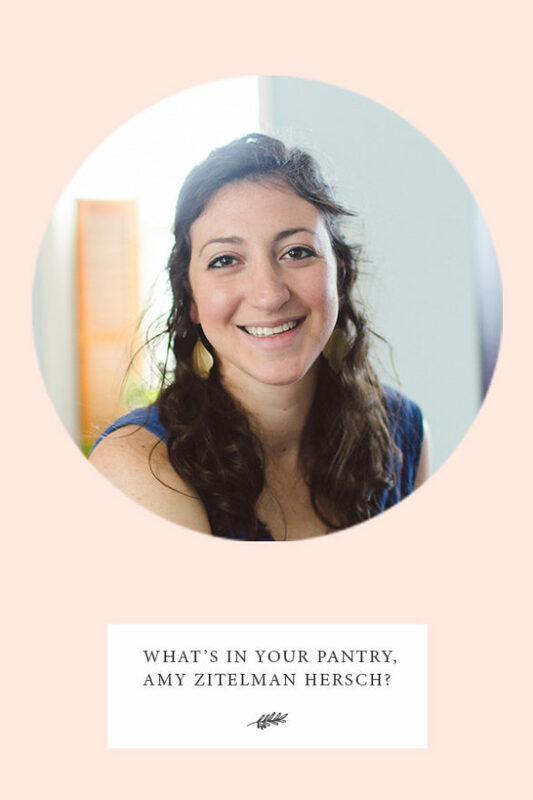 What’s In Your Pantry, Amy Zitelman Hersch? What’s in Your Pantry? is a recurring feature where I ask women to tell us more about their food and eating habits by opening up their kitchen pantries to us. This week I’m featuring Amy Zitelman Hersch. She is the youngest of three food loving entrepreneurial sisters (they all are co-founders of Soom Foods). Dog-Mom to Taz, a sensitive black lab mutt. Wife of Darren, the most reasonable man in the world. I live in Philadelphia, PA with my husband, Darren and our dog, TAZ. TAZ stands for Teddy Afro Zitelman – he’s named after the Ethiopian pop-star, Teddy Afro. I grew up in Rockville, Maryland – the youngest girl (of all girls) to Cindy and Rick Zitelman. We call our dad Rabbi Rick because he is learned and insightful and wonderful. Our Mom is our entrepreneurial inspiration. Our Dad was able to start his own business in the mid-80s because our mother’s was doing so well. I attended the Charles E. Smith Jewish Day School from first through 12th grade where I learned the balance of work hard-play hard, and made some of my closest friends. I received my B.A. in Communication with a focus on interpersonal communication from University of Delaware, where I had the fortune of learning what it really takes to have healthful relationships and finally put a positive spin on my grandmother’s qualm that I have an answer for everything. I played basketball competitively through high school and for fun through college. I don’t play anymore but I’d be down for a game of HORSE. Now, I get my exercise through walking TAZ and doing yoga. I love yoga for the physical and mental strength it helps me work towards. When we cook, we keep it simple because, to be honest, we love to eat out. Our go-to meal consists of chicken or salmon (sometimes a sweet turkey burger) with couscous, a baked sweet potato, and something green (brussel sprouts, green beans, or zucchini). My favorite food is pizza and I prefer everything on bread. My sisters and I started Soom Foods almost five years ago – I took my degree and have applied it to talking about tahini. All day. Every day. For five years. Believe it or not, I still eat tahini at least once a day. Calm. I can only imagine how much anxiety someone feels when they have little to nothing in their pantry. I’m really very lucky. Spices go together, grains go together. Really, nothing special. We keep our entire “pantry” in the shelves above the dish rack. It’s small – we don’t keep a lot in our house. Honey. Klil is a small “off-the-grid” kibbutz in the North. A woman there makes the best honey. Naot Smadar dates. I like to keep my dates in the fridge, they’re more refreshing. Soom tahini and chocolate sweet tahini spread. I mean, obviously. But the chocolate is so so so good. Life cereal and Golden Grahams – I will always love cereal. We don’t keep many (if any) sweets in the house. But Darren’s favorite ice cream is Chocolate Haagen Dazs. The Short Stack Cookbook(s): The ethos behind Short Stack Editions is simple: Pair honest, common ingredients with trusted voices in the culinary world for inspired recipes home cooks can actually use. I would organize my pantry! Organizing to make room to store dried beans, legumes, and pasta. Your turn: Like Amy, I also love to bring home food from my travels. When you travel, which foods do you tend to bring home with you?